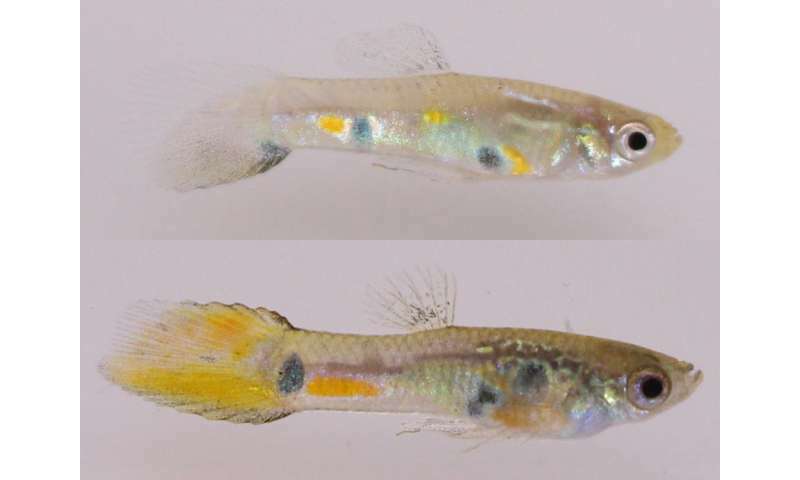 Female guppies with smaller brains can distinguish attractive males, but they don't recognise them as being more appealing or choose to mate with them, according to a new study by UCL and Stockholm University researchers. The study, published in Nature Ecology & Evolution, adds weight to the link between mate preference and cognitive ability. "One of the biggest decisions a female guppy has to make in its life is choosing who to mate with. It is very important, so you might think they would all prefer a single most attractive male," said one of the study's senior authors, Professor Judith Mank (UCL Genetics, Evolution & Environment). "But we found that it takes a certain amount of brain-power to size up an attractive mate." The research team studied female Trinidadian guppies in two groups differentiated by brain size and mating preferences. The fish were exposed to males that were either colourful with long tails, which are more commonly attractive to females, or males that were less colourful. The researchers allowed the female fish to evaluate the males, keeping the fish in separate tanks so exposure was only visual. They then measured gene expression on the brain tissue of the females to gauge which genes were being actively expressed in two brain areas involved in processing visual signals and in integrating those signals to make complex decisions. The researchers found that all of the females exhibited similar patterns of activity in the sensory processing areas of the brain when they saw an attractive male, suggesting they can all see the difference between attractive and dull males. But only the larger-brained fish showed different patterns of activity in decision-making brain regions when they saw attractive or unattractive males. Among the females with clear mate preferences, the genes that were activated by seeing an attractive male were more strongly connected to decision-making pathways. "Guppies are an excellent example of ecological adaptation, and this raises questions about potential trade-offs with increasing intelligence," said the study's first author, Dr. Natasha Bloch (UCL Genetics, Evolution & Environment). "Brighter colours could attract predators, so there's an assumption that fish in environments with many predators would evolve to be less colourful, but there may be a more complex relationship involving predation pressure, female choice and cognitive ability," she said. "While the exact mechanisms behind female preferences in guppies require further investigation, we know that not choosing colourful and long-tailed males would be disadvantageous, as their sons would not inherit the optimal genes for appearance, and would thus have a harder time finding a mate," added co-author Dr. Alberto Corral-Lopez (Stockholm University). "By clarifying what happens in the earliest stage of female mate preference behaviour in animals with different cognitive abilities, we have shed light on the structure of the genetic networks underlying female mate preferences, adding to our understanding of how animals evolve different mating patterns," said co-senior author Professor Niclas Kolm (Stockholm University).